IoT Analytics, a leading provider of market insights & competitive intelligence for the Internet of Things (IoT), M2M, and Industry 4.0, today published a comprehensive 375-page market report titled Industry 4.0 & Smart Manufacturing 2018-2023. The report, which was compiled over the course of 18+ months, is a holistic compendium that analyzes 350+ related product offerings, details 38 case studies, and describes a total of 79 trends. It serves as a strategic guideline and strong foundation for any company aiming to make sense of what is happening at the intersection of digitalization and the manufacturing sector today and in the coming 5 years. The term Industry 4.0 (I4.0) has become a global term to describe the 4th industrial revolution. Unlike the prior industrial revolutions, this revolution is not built around a single technology, but rather the combination of multiple technologies that forward-thinking manufacturers are implementing to realize key use cases that are improving efficiencies, creating new revenue streams, and reducing risks. 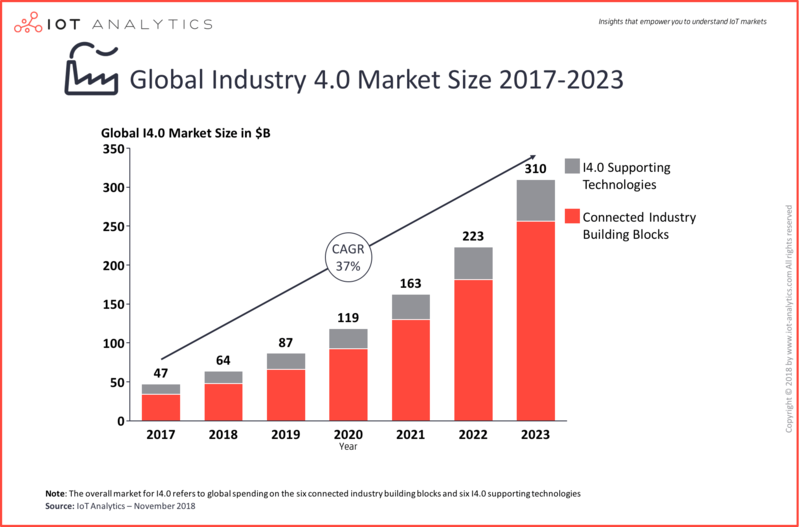 The connected industry building blocks subset of the I4.0 market is further broken down into the 6 building blocks (hardware, connectivity, cloud platform & analytics, applications, cybersecurity, system integration), and 7 regions (North America, Europe, Asia, Middle East & Africa, Oceania, South America, Other). 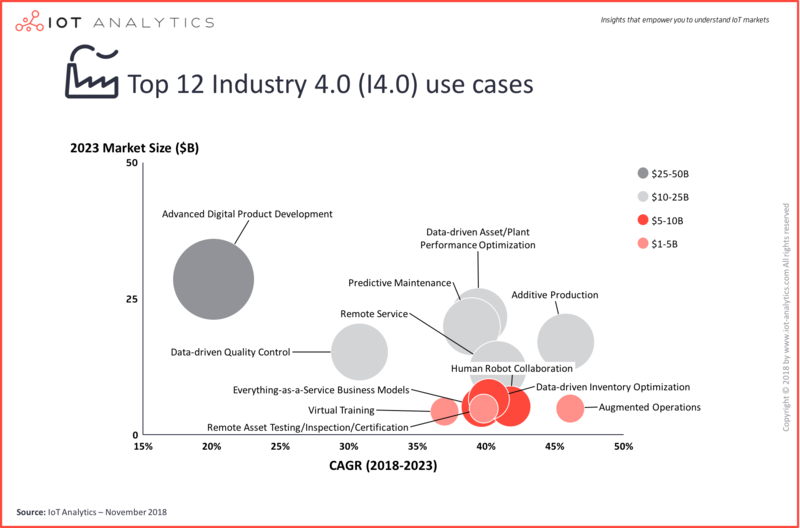 The I4.0 supporting technologies subset of the I4.0 market is further broken down into the 6 supporting technologies (additive manufacturing [3D printing], augmented and virtual reality [AR & VR], collaborative robots, connected machine vision, drones / UAVs, self-driving vehicles [SDVs]). The report also analyzes the I4.0 adoption strategies of 3 types of companies that are affected by I4.0: OEMs, factories, and industrial automation suppliers. The OEM adoption strategy analysis explores the relative maturity of IoT projects in 29 different industries. The factory adoption strategy analysis, among other things, highlights the “smart factory” strategies of 5 different companies/institutions. 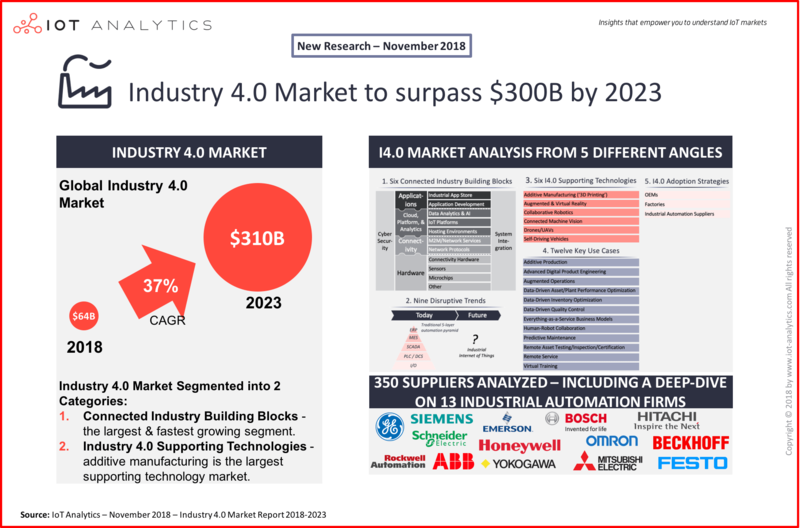 Another part of the I4.0 adoption strategies section includes an analysis of 13 leading industrial automation suppliers, of which 5 of the largest suppliers are ranked based on their overall I4.0 readiness, which considers investments and product offerings in I4.0 technologies. In developing the 375-page report, the analyst team studied over 350 companies that offer I4.0 products and services and attended 25+ leading IoT and I4.0 conferences (e.g., Hannover Messe, SPS IPC Drives, IoT Solutions World Congress, IOTHINGS, Bosch ConnectedWorld, Industry of Things World, Internet of Manufacturing, IoT Tech Expo, IoT World, Hitachi NEXT, PTC Liveworx, Siemens Analyst Day, etc.). Further insights for the report were gleaned from interviews of 100+ experts covering a variety of I4.0 technologies and industries. The post New market report uncovers 9 disruptive trends and ranks 12 key use cases transforming smart manufacturing appeared first on IoT Analytics.